People seem to like Happy Bunny so much as GoAnimate's Complaints Desk Operator that he was the obvious choice for this years Christmas animation from yours truly. This outing I wanted to get back to a more universal humor and move away from some of the GoAnimate member centric humor of the previous episode, hence no members where parodied, sent up or poked fun of in the making of this animation. Except perhaps for myself. 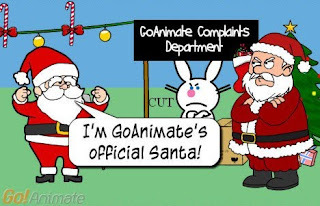 My goal was to try and use as much of GoAnimate's Christmas theme as possible whilst still trying to maintain the idea that this is a Complaints Desk and therefore people should be complaining. It was obvious to me that Happy Bunny would naturally be cynical about the whole Christmas Holiday season and not really appreciate any attempt to decorate his space with 'holiday cheer'. However he would also get a certain satisfaction out of undermining the Christmas spirit by spreading the cheer with 'False Hope'. This time around Street Fighter's, Ken only makes a brief appearance because I kind of feel I've done the Bison, 400 GoBuck, joke to death - though Bison's cameo I just couldn't stop myself from including. Other regulars, The More Actions Protest Group nearly got a bigger role because all of the Christmas Theme characters could quite legitimately join their group. However this idea was canned when I realized the new character creator now included (just in time for Christmas) a Santa, standard template character - and his female assistant. Naturally the original GoAnimate Santa would be threatened by this development and would certainly have grounds to complain. There were all sorts of ways I could have gone but the idea of the new GoAnimate Santa having a beautiful assistant with a mouth just like Happy Bunny's really does appeal. Can you imagine her keeping all those unruly kids, wanting to sit on Santa's knee, in line with some kind of back hand remark.